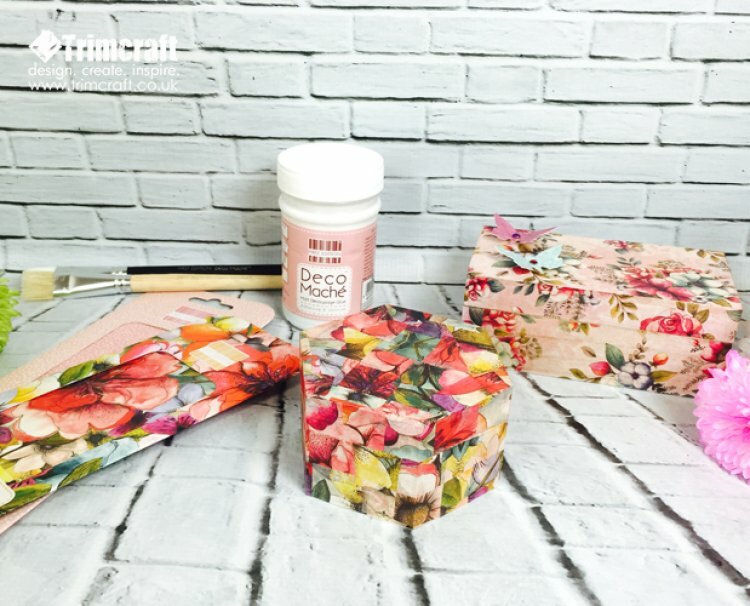 Decoupage papers are perfect for upcycling a large range of surfaces from wood, metal and glass, so there is no excuse not to use Deco Maché with your craft projects! 1. Make sure your surface is clean and dry then paint a layer of First Edition Deco Mache Matt Adhesive glue. TIP: Before applying the deco maché, you can paint the surface in a light paint to ensure your papers stand out especially if your deco maché has a dark background. 2. Tear a piece of deco maché paper and place onto your gift box and seal with glue. Continue to do this, slightly overlap each piece of deco maché paper. 3. As an alternative, you can use one piece of deco maché paper to cover the all surface if you want a more uniform look. You can also cut your paper into squares instead of tearing for a collaged effect. TIP: Use the firm hog hair brush to control the application of the Deco Mache papers follow with the softer nylon brush to create a smooth varnished finish. 4. Once you have completely covered your gift box, you can give your project a professional finish by applying a layer of varnish. 5. To decorate the back of lid and inside of gift box, we would recommend unscrewing the bolts so you can glue your deco maché more freely. 6. We have then used a different patterned paper for the inside of the gift box for a contrasting designer look. TIP: Use sand paper or a nail file to sand around the edges of your object; this gives a smooth finish to your design. For a smooth edge, sand lightly or sand further for a more distressed finish. Wooden boxes are just the start of what you can Deco Maché and there is a vast array of on trend designs to choose from. We would love to see what you have transformed using First Edition Deco Maché, remember to upload and share your creations on the project gallery.